Back camera is close to supported in 4.14-rc1. There's bluetooth support at bluetooth-next, but that works on N950, not on N900. Bluetooth . There's a driver ported to 4.13 at bt-v4.13 tree, git.kernel.org, linux-n900 . We currently only support installing and running pmos from the microsd card on the n900. the built in emmc is quite slow and fragile. Choose 'nokia-n900' as target device. Install u-boot from pali on the n900 in Maemo. If this does not work from the graphical interface you may run "apt-get install u-boot-flasher" in maemo terminal (see 1 2). See Additional Info below for instructions on configuring pmos to boot by default. Note: This will set pmos as the default boot option. 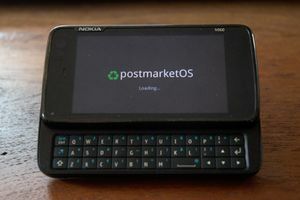 Maemo will still be accessible when booting the N900 with the keyboard slide out and selecting the relevant boot option in the u-boot boot menu. The linux-firmware-ti-connectivity package is required to provide the wl1251 firmware necessary for initializing the wifi device. (#1414) You get asked during pmbootstrap init if you would like to install that proprietary firmware package. Now you can use NetworkManager's console UI to connect to your network. Please note that nmtui does not work properly when started from tmux. The MAC address of the N900 WiFi interface its being randomized at every boot, since the connection profile created with nmtui is bound to the MAC address, it won't work at the next boot. It should be possible to disable power saving for better ping times, see maemo-leste#172. Modules need not to be compiled, sound support is built into kernel. Install alsa-utils. NikkSaan provided an advanced audio configuration in #702 (comment). 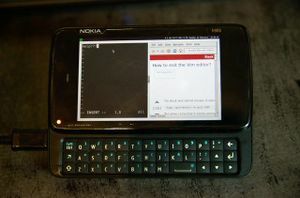 The keyboard layout for the virtual console is asked during pmbootstrap init after you select the nokia-n900 device. On the N900, install kbd-bkeymaps, either by using pmbootstrap install --add kbd-bkeysmaps on the host system or by running apk add kbd-bkeysmaps on the device itself. Compress it and copy it to /usr/share/bkeymaps/us/ on the N900. Log into the N900, and run sudo setup-keymap, then select us and finally rx51_us. In X11 you can use setxkbmap to configure the desired layout. Right now it's configured to use the nokiarx51/us layout by default (see 40-xkb.conf). You can use the blue arrow key in combination with the Volume Up/Down to switch to a different virtual terminal. I3wm is the recommended UI. It is lightweight and fast, and we have a custom N900 configuration that optimizes for its keyboard (photos). The most important keybindings are described below, for details see i3wm.conf. This file gets installed to ~/.i3/config and of course you can customize it. If you have good additions, please make a merge request so everybody benefits from an improved default config. shift + space: switch to "command mode"
q: go back to "default mode"
q: go back to "command mode"
XFCE4 does not have performance issues, but since this UI is not optimized for keyboard only usage or for touch screen usage, it is not as userfriendly as i3wm with the postmarketOS default config. As of 15th May 2018, Hildon is unusably slow. This is due to the fact that Hildon requires acceleration which is not supported at the date of writing. There are also Mate, Matchbox, etc. You can bind it to any key you wish. XF86WebCam is a good choice since it's fairly easy to reach and isn't used for anything. Battery charging is fully supported by the kernel and does not need any special configuration. 1) Charge it up fully, using a wall power adapter. 2) Unplug the device and allow the battery to run all the way down until it powers off. This may take quite a while to happen (>24hrs, but can be made shorter by running a CPU intensive workload). Do not let it charge at all during this time. This means you may not use USB for example, as this automatically causes the device to start charging, albeit slowly. 3) When device eventually powers off, the battery charge gauge chip should then be calibrated. You may charge it up again to use the device. Hint: To disable the LED charging indication, disable the charging chip's status pin. Currently, when battery gets below suitable operating voltage, the device dies. This is bad for the battery and the file system. Here is a script that monitors the battery, and powers the device off before the battery reaches critical state. For suggested usage, read the program comments. $ date -s "2017-08-14 16:34:50"
Realtime clock at /dev/rtc0 is on the twl4030 (PMU), and allows setting an alarm to wake the device from sleep, poweroff states. Control trough rtcwake (Manual Page). # To set new wakealarm time, first reset time to 0! When setting number of seconds since epoch, make sure you account for your timezone and see how your realtime clock keeps the time (utc or local)! In order to use the ofono test scripts, you must install py-dbus, that is currently available only for python2. The N900 needs internet access to perform these steps. See the section above on setting up Wifi. Your date/time need to be correct in order for HTTPS to work. You can use ntpd to do this. The Mass Storage class exposes a block device as a flash drive on your host machine. GPRS can be managed by connman. Either install connman using apk or add it when installing pmOS by passing --add connman to pmbootstrap. Once you perform the following steps, the GPRS connection will be established by connman automatically on every boot. Edit APN, where <IMSI> should be replaced in the following commands with the IMSI from your SIM card. Replace <APN> with the relevant APN for your cellular carrier (e.g. fast.t-mobile.com). This file should be created when ofono starts, so you should only need to add the APN. Start ofono and power on modem. First, get network and date to work. Next, clone tui repository. it contains includes many goodies, including script for hardware testing, gps support, and graphical ofono control software. Next, install packages necessary for compiling software and prepare gps2. enable-modem, online-modem and you should be able to run gps2. AGPS is not available, so expect long startup. gps2 will not talk to gpsd, so it is only useful to verify that hardware is working.